Hello! I think that your skin and hair are some of the most important things to maintain. Let's save hair for another day, because I want to talk about skincare. There are people who splash water on their face and that is their idea of "washing" it. No no no.. 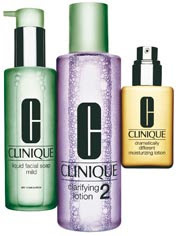 I began using the Clinique skincare system Christmas day to be exact. My skin has literally become so much smoother and healthier looking. It used to look washed out and dry, but now it has a glow to it. I have really dry skin and I am not prone to breakouts so I use Type II. I am supposed to be Type I, but the saleswoman said if I want extra exfoliation then I should try Type II. There is a quiz that you can take to find out your skin type here. So for about $53 you can buy the 3 step skincare package that includes liquid facial soap, clarifying lotion, moisturizing lotion, a lotion pump, and a clear Clinque bag to hold everything. All products are 100% fragrance free. Step 1: Liquid facial soap 6.7 fl.oz. It makes your skin feel really smooth and clean. Step 2: Clarifying lotion 16.5 fl.oz. This is not actually a lotion. It is a liquid and the 3 step set comes with a pump to screw on the bottle. When you use all of the lotion, keep the pump to put on your next bottle. This lotion has a strong smell like rubbing alcohol. To use this product, pump the liquid on a cotton ball and rub on your face. It might burn a little and I thought I was allergic to it, but this is completely normal! Step 3: Dramatically different moisturizing lotion. 4.2 fl.oz. This hydrates my skin so well! I love this because my skin feels so smooth. A little of this lotion goes a long way. I really recommend this for your skin. I have dry skin, so these products fit my needs. If you have oily skin there are products for you, too. I am not even halfway finished with my products so they last a long time. You may be hesitant to buy the whole set at first, so try the sample sized products. Here is a link to read about each step. The bag that came with it is great. When I bought the 3 step products, I received a free silver tote. They probably don't have that anymore, but go to your local Clinique store and check out their freebies!